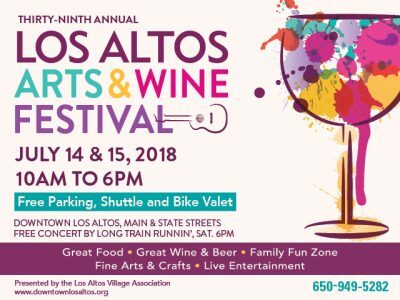 On the second weekend of July, downtown Los Altos transforms into the largest two day, mid-summer event in the Bay Area! The highly-rated Arts & Wine Festival showcases the distinctive works of 290 artists and craftspeople from over a dozen states. The Festival also features select vintages by the glass from local wineries as well as a wide variety of foods. Enjoy our day long free concerts from performers such as Sage, The Cocktail Monkeys, The House Rockers, Debbie Thacker, and Fred McCarty. The Festival is a great event for the whole family with a large selection of rides, activities and entertainment for children all weekend in separate the Kidzone.